Sen. Susan Collins, R-Maine, is questioned by reporters as lawmakers arrive for a vote, at the Capitol in Washington, Oct. 17, 2017. Vice President Mike Pence cast the final vote late Tuesday to break a 50-50 tie. 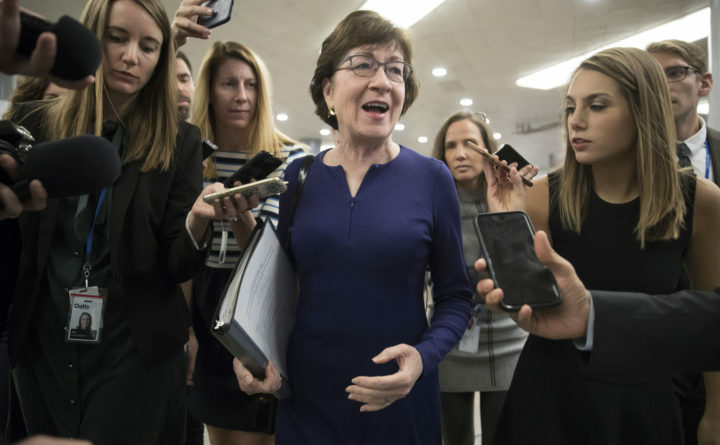 Maine Sen. Susan Collins, a Republican, voted to repeal the rule, while Sen. Angus King, an independent who caucuses with Democrats, voted against its repeal. The vote reflects the effort of the Trump administration and congressional Republicans to undo regulations that the GOP argues harm the free market. The measure now moves to President Donald Trump’s desk for his signature. Democratic lawmakers said the Consumer Financial Protection Bureau’s rule would have given consumers more leverage to stop companies from financial wrongdoing. They cited the sales practices at Wells Fargo and the security breach at credit company Equifax as examples of misdeeds protected through forced arbitration. Republicans said the arbitration system has worked ”wonderfully” for consumers. They said the payouts for the average consumer in arbitration cases are generally much larger and come more quickly than when compared to the relief gained through class-action lawsuits. King came out against the rule’s repeal in September, saying the Equifax breach showed “exactly why the CFPB implemented their new rule.” Democrats said class-action lawsuits would serve as a powerful tool for consumers. “Once again, we’re helping the powerful against the powerless,” said Senate Minority Leader Chuck Schumer, D-New York, as the Senate neared the vote, sensing the Democrats would lose.